Summer fruit galore! I stopped by the farmers market this morning and there are stone fruits of all colors on display. 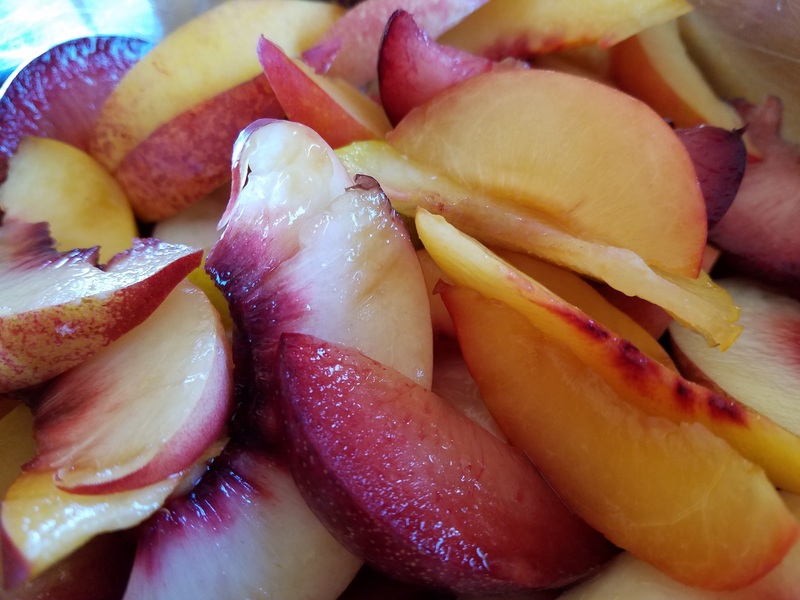 Peaches, plums, pluots and more, and they are all bursting in juices and flavors. How can you resist? I came back with a full bag of stone fruits. They are best eaten fresh and naked, but what else am I going to do with them? Clafoutis! 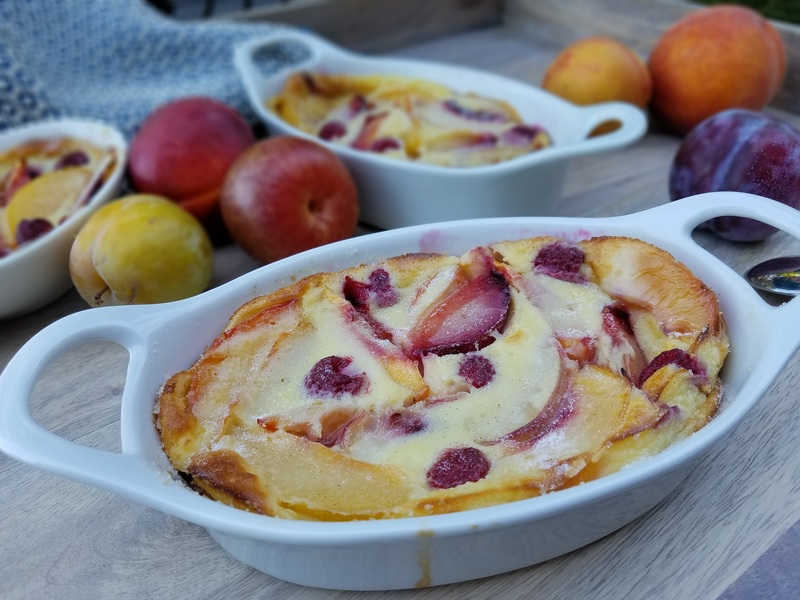 This is a really simple recipe, and after tasting them warm and chilled, the vote goes to chilled stone fruit clafoutis. 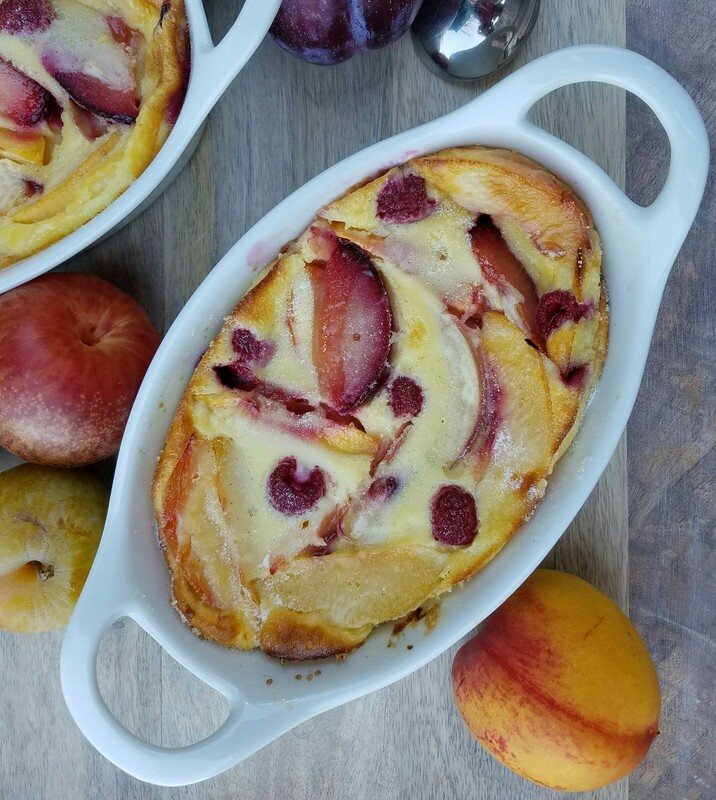 Try this recipe while the stone fruits are still in season. Stir the milk, heavy cream, sugar, vanilla bean and salt together in a medium saucepan pan over medium high heat until the sugar is melted. Do not boil the mixture. Grease the bottom and sides of a 2 quarts baking dish and dust with sugar. Slice the stone fruits and mix with the lemon juice and 1 Tbsp of sugar. Distribute the fruits evenly in the baking dish. Whisk 2 eggs with the flour until there are no lumps. Whisk in the remaining two eggs until the batter is smooth. Slowly add the milk mixture into the batter, whisking continuously. Ladle the egg mixture over the stone fruits. 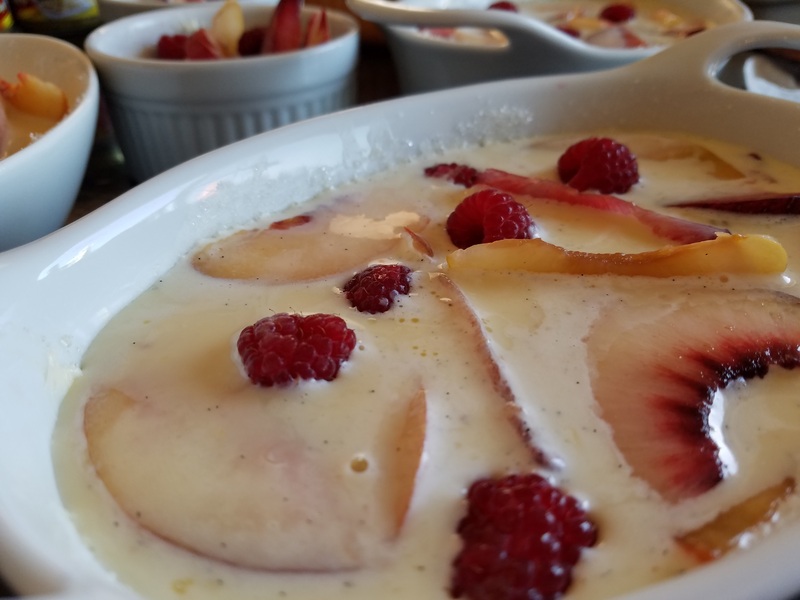 Scatter some raspberries over the custard to add some colors and tartness to the dessert. Bake in the oven for 30 minutes until the custard is set. Test with a toothpick inserted in the middle, it should come out clean. Bake longer in increments of 5 minutes if needed. The custard will puff up around the fruits and turn golden brown. Do not overbake. Most recipes recommend serving the clafoutis warm. I find the custard is too tender and the dessert came out too mushy for my liking. Instead, once the dish is completely cooled, I chilled the dessert in the refrigerator for a couple of hours. The custard sets and releases nicely from the dish. Enjoy.